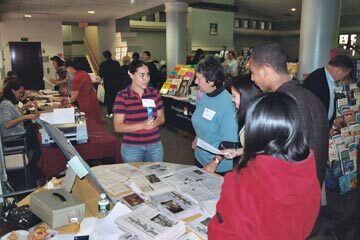 Evelyn Canales, the editor of Silver International, speaks with a teacher about the publication. Mohammed Kayati, Quynh Nguyen and Chizen Li look on. On October 18, four representatives from Silver International attended a Washington area ESOL teacher's convention, held in Annondale, Virginia. The purpose of their visit was to advertise Silver International and make the newspaper better known outside the Montgomery County area. In order to achieve their goal the staff members gave a short presentation explaining how the newspaper works and why it is important to have a publication like this in school. They also met with teachers in an exhibit area. According to Caizhen Li, one of the staff members who attended the convention, the newspaper is important because it is a voice for international students, "It's a way to connect every body's culture together," explained Caizhen. Teachers who attended the convention were able to read articles written by students from previous issues. Some teachers took sample newspapers to share with their students, and others subscribed to the newspaper. Teachers who bought a subscription of 10 or more copies have the opportunity to have their students published in Silver International. The purpose is to encourage students to write and also to publish their work.